On Saturday, I officially graduated from Metalworks Institute, ending once and for all my life as a student. Now what? Over the past few months, I have been trying to find my place in terms of what specifically I am looking for as a job. I can’t seem to settle for anything less than something that get’s me closer to the dream job. One that won’t feel like work. In the words of Alan Cross, a job that will make me feel like I’m 22 forever, although I’m already 23. It’s weird to be out of school and under/unemployed. At least I have things to keep me occupied while I a waiting to land a job. I have the piano, a new camera, various hobbies (like writing) and my music blog which is coming closer to being something more. The aspect of starting my own business is becoming more and more a reality. I am excited, thrilled and well scared. The night of graduation I won 2 pretty awesome awards. One was a mentor opportunity with Allan Reid, General Manager of Maple Music and former Senior VP A&R at Universal Music. I’m looking forward to learning new things. 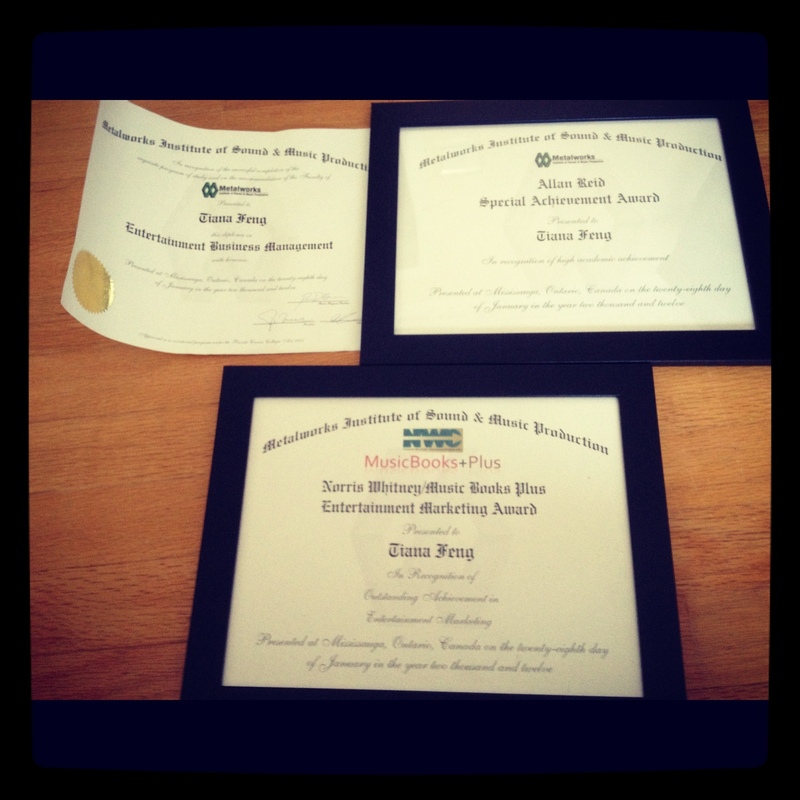 The other was an Entertainment Marketing award and the prize was $300 to spend on Music Books Plus. I’m looking forward to reading industry books and increasing my piano repertoire library. The future has limitless possibilities. It’s a life-long learning process. It’s a little bit scary because it is still unknown, but that’s what makes it exciting. All I know is that I’m headed somewhere awesome. Love Ya Tiana! Congrats and know that we’re all here beside ya standing together walking into the future! Any time you need anything and think I could help never hesitate to ask! To the future and beyond! !